After launching two new TVC’s for 97.3 FM’s breakfast show earlier this week, the Brisbane station launched a new marketing activity today that didn’t cost it anything. Brisbane motorists on Friday were treated to the cheapest fuel price that has been widely available in Australia in about 15 years. 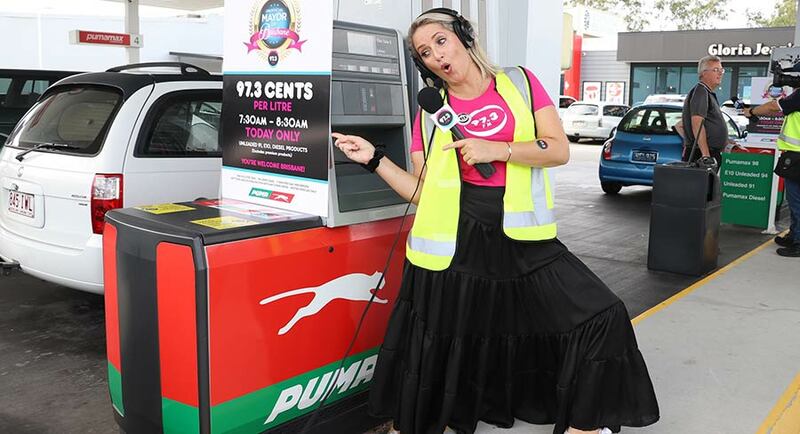 97.3FM Brisbane partnered with Puma Energy Australia to cover the cost of the fuel, and customers lined up for up to one kilometre to take advantage of a low cost of 97.3 cents per litre for petrol at four different Puma locations covering Brisbane’s north, south, east and west. The promotion was available for an hour between 7.30 – 8.30am, and the savings to Brisbane drivers, covered by Puma Energy, were close to $14,000, with thousands of litres of fuel driving out the door of the four locations. The activation was part of 97.3FM Brisbane Breakfast’s Unofficial Mayor campaign that has seen 97.3’s Bianca Dye come on board to lend Brisbane’s Lord Mayor Graham Quirk a hand. Brisbane’s Unofficial Mayor Bianca was down at the Archerfield Street Puma station this morning to assist with pumping petrol, washing windscreens, offering beverages and speaking to customers about what these savings meant to them. 97.3FM content director Barry Drinkwater said: “While the Lord Mayor is doing an incredible job of managing the city, 97.3FM was keen to come on board to help ‘Give Back’ to the people of Brisbane. The petrol promotion follows other recent activations including free coffee for a day from any Coffee Club in Brisbane, free rides for families on the Wheel of Brisbane and an RSPCA adoption drive with more activities to come.